Another weekend, another music festival. 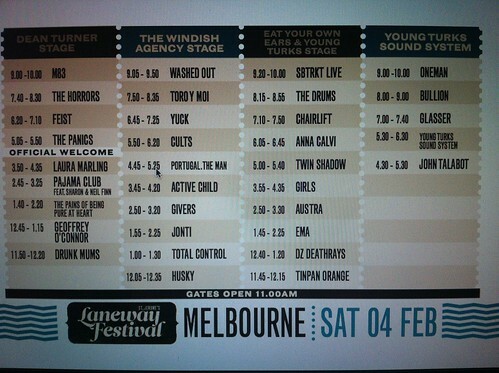 This time it was the festival described by one of my festival buddies as "so indie it hurts"- the Laneway Festival. 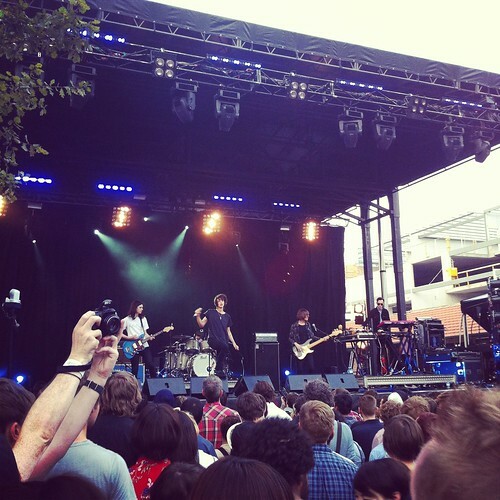 I went to Laneway Festival last year and wasn't super impressed by the festival but when given the opportunity to attend for FREE, I couldn't resist. Mostly because of one band - The Horrors. I could re-count the tales from the day but I'm pretty sure it'd go down much like my last post (about Big Day Out) - hot, great bands (for those who care, I saw - Laura Marling, Portugal The Man, Cults, Feist, The Horrors, The Drums & M83), great friends and Calippos - so instead I'll just write about The Horrors and my undying all consuming love for them. Let's re-wind about 5 or 6 years while I was still working at JB Hi Fi. I was at that stage in my life where I was still discovering new bands. I was also pretty obsessed with The Mighty Boosh and I read an interview where Noel Fielding interviewed this extremely strange and peculiar band - The Horrors. I knew we had received their new EP at work so when I was back at work I had a listen - from that moment I was hooked. Their sound was unlike anything I had heard before - it was creepy, catchy, bizarre and oh so good. Since then, each album that they have released has been an evolution of their music style and they've somehow managed to become even more haunting and beautiful. The very first time I saw them perform was at the Glastonbury Festival in 2007. It was manic, frantic and brilliant. They were crazy good live - engaging, mesmerising and delightfully weird. I was also really lucky to see them play at Electrowerks in Islington London that same year. Of all the shows I saw while in London that year this one stands out as one of my all-time favourites. It was a small (tiny) venue and I can still feel the energy coming from both the band and the crowd. Electric and mind-blowing. I've been lucky enough to see them live now 6 times and it's been pretty cool to see their transformation - from garage punk weirdos to all out indie cool (sans make-up but still oozing that Gothic charm). Every time I see them live it's a highlight. They draw me in until it's all I think about, and all I listen to. P.S I am now up to 3 of 10 new bands (who I have gone out of my way to see live) for my 50 things list!! WOO HOO!! !